Today, we enjoy the largess of such breeding and also the development of cuisine devoted to this green, Brassica oleracea. Traditionally, they are slow cooked with some type of pork, but vegetarian recipes abound as well. There is a another reason for Collard Greens’ popularity. It is ranked as one of the most nutritious greens, second only to mache. High in protein, calcium, Vitamin A, B vitamins, iron, phosphorous, magnesium and potassium, nothing beats collards fresh from your own organic garden. And a recent study at the University of East Anglia found that a compound in collards called sulforaphane can help prevent and slow cartilage damage and osteoarthritis. Perhaps no other vegetable so represents the South as this one. It was relied on during the American Revolution and grown by Thomas Jefferson at Monticello. It has historically been enjoyed cross-culturally, though we certainly owe a debt to the African Americans enslaved here for learning the best and most economical ways to prepare and store. 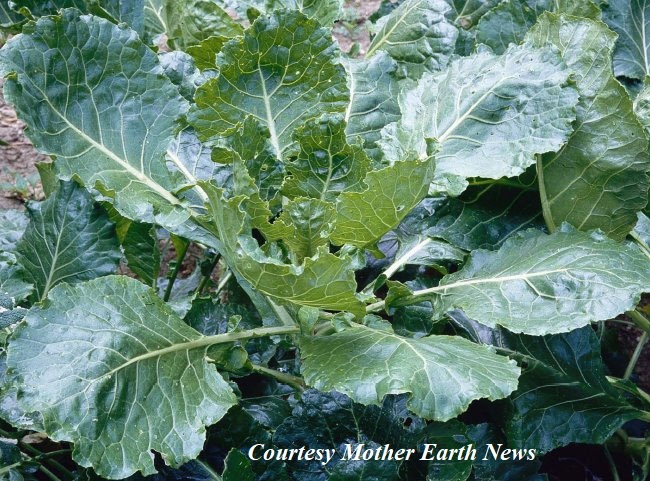 Easy to grow, and often seen in large family patches, you can grow just four collard plants in a 4 x 4 raised bed and harvest a leaf or two at a time from the bottom of the head over a very long growing period, or you can harvest the whole head leaving the stalk in the ground to sprout again. Collards do require at least 4-5 hours of sun and a loose sandy soil for Spring crop or heavier loamy soil for Fall/Winter crop. They are extremely cold hardy and can survive frosts and light to medium freezes (which converts some of the carbs to sugar, making them sweeter) but will bolt in the heat of summer, so grow either very Early Spring or in the Fall/Winter. Starting seeds indoors or in the greenhouse will give you a jump on either season. They are heavy feeders and need nitrogen for consistent growth. They also need consistent water, 1.5 ” each week, either by rainfall or irrigation. Do not cultivate deeply. You can mulch for weed prevention. 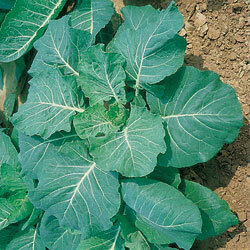 Depending on the variety, collards may suffer munchers, though not as much as other brassicas. But in an organic home garden, especially in a raised bed situation, you can address by several organic methods including a strong spray of water, companion planting by nasturtiums and tomatoes as well as aromatic herbs, which will also improve flavor, and finally a homemade hot pepper spray really works (just be sure to wear gloves when applying and reapply after a rain). I am pleased to be selling three different organic heirloom varieties this year each with its own regional interest. First introduced in 1879, and popularized by Burpee in 1944, the popular variety Georgia is a non-heading type that forms large rosettes 3′ high. It takes 80 days from early transplanting to harvest. 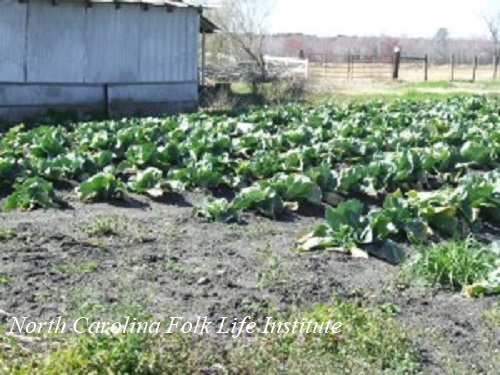 Carolina Cabbage Collard, also known as Yellow Cabbage Collard, is a North Carolina heirloom variety for which it is very hard to acquire seeds as they are closely guarded by the Eastern NC families that grow for market stands. Many prefer the tender, silky texture and mild, non-bitter flavor of this variety. Not really yellow, but a lighter green than other varieties. A choice of the ‘Ark Of Taste’ which writes: “Making its appearance in the late 1880’s, Yellow Cabbage Collard continued to be prominent with readily available seeds for purchase in North Carolina until approximately 1975. Colonel Joe Branner, proprietor of the Asheville Greenhouses, began the production of the seed in eastern Carolina in 1887 by sowing full collard seed in his greenhouse, which responded to the local soil by growing a bit shorter and more cabbage-like, naturalizing over time to its new environment.” Non-heading it grows year round in full sun or partial shade with a 45+ day growing cycle. Plants grow to 2′ x 2′. Green Glazed Collard is a rare resurrected variety whose lineage dates back 200 years.It not only has a beautiful waxy appearance, it is more resistant to cabbage worm and cabbage looper, thus easier to grow organically. It is also heat and frost resistant and slow to bolt, making it a good choice for Southern gardens. The Cascade variety I offer was developed in the NW, and retains the recessive gene for the glossy appearance but occasionally kicks out a regular collard which should not be allowed to go to seed (to protect the strain). Non-heading and early. 60 days. 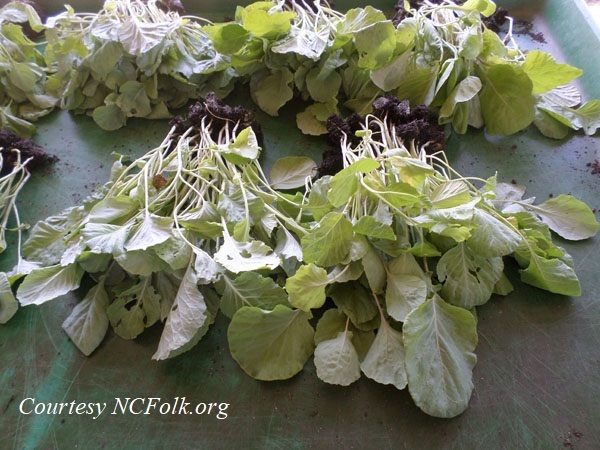 I hope you will give collards a try in your home garden this year … even if you are a “Nawthener” Happy gardening y’all! This entry was posted in Cooking & Recipes, Garden, Health, History and tagged Collard, Monticello, Organic Garden, Southern Food, Thomas Jefferson by Cherry Gal. Bookmark the permalink.